Satellite image data, is now widely used in archaeology, and can provide a means to assess rapidly the quantity, type and preservation of archaeological remains across large-swathes of territory. However, the accuracy of imagery interpretation depends upon the quality of the underlying ground control. 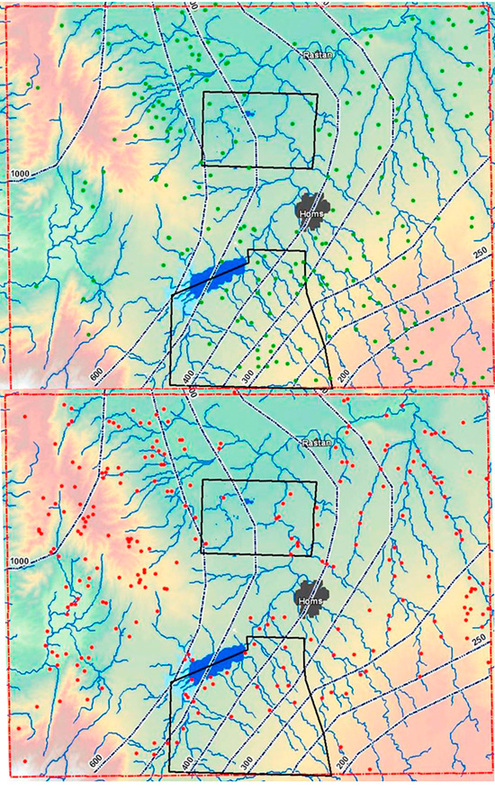 This project seeks to use the tight ground control provided for a 600 km² region of the Orontes Valley by the landscape project Settlement and Landscape Development in the Homs Region, Syria, to facilitate the systematic investigation of satellite imagery covering 2500 km² of largely unsurveyed terrain adjacent to the original survey area. The aim is therefore to assess the extent to which the patterns detected through fieldwork, can be extrapolated across a wider area on the basis of remotely sensed data. The project then aims to compare long-term development of settlement in west Syria, an area which remains poorly understood, with trends identified in better-surveyed areas such as Israel and Jordan to the south, and Mesopotamia to the east. 3. the relationship between settlement change over time, and local hydrology as this can be reconstructed from the SRTM Digital Elevation Model and examination of wadi sections. Beck, A. R. & Philip, G. (2013). The Archaeological Exploitation of Declassified Satellite Photography in Semi-arid Environments. In Archaeology from Historical Aerial and Satellite Archives. Hanson, William S. & Oltean, Ioana, A. Springer. 261-278. In the maps above, sites associated with the place name ‘tell’ (=mound) most of which are of Bronze / Iron Age date are marked in red; those designated by the term khirba (ruin) which is usually associated with sites of Roman or Medieval date are marked in green. While tells show a very close association with water courses (blue lines), this is less obviously the case with khirba place names. Note also the absence of khirba place names in the western part of the study area. This suggests that not only were there significant differences between patterns of settlement and land-use in Pre and post-Roman periods, but that the intensity of these changes varied across the landscape.